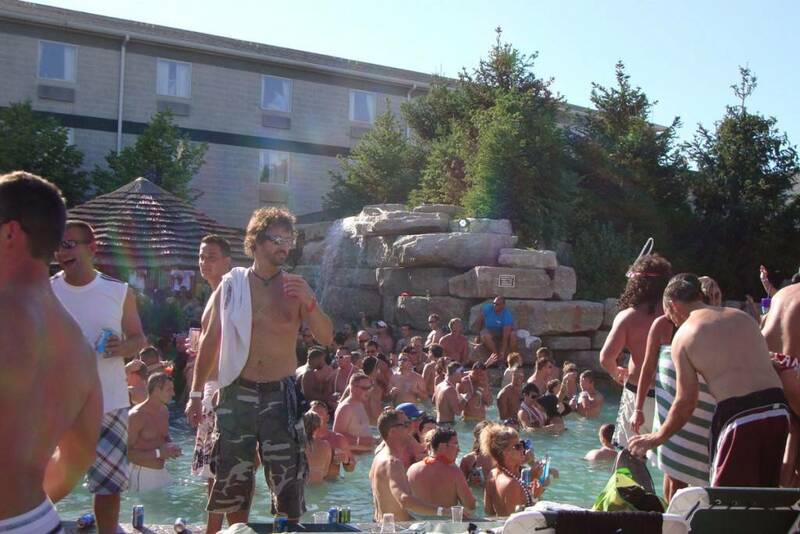 The new Commodore Resort Hotel on Put-in-Bay is an updated version of one of the island’s original party spots. CHECK AVAILABILITY! We feature rooms which include: king jacuzzi suites, eight-person suites, and the traditional two double bed standard rooms. In addition, handicapped rooms are available. Everyone loves the new rooms, the new amenities, and the new superior service that we offer. All of the rooms in the new building come equipped with high-speed internet, microwaves, refrigerators, and the majority of the rooms have a view overlooking the infamous MIST pool area and tiki bar. We have catering available for larger groups of up to 100 people for business meetings, banquets, weddings, and parties. Guests can opt to rent upstairs in The Green Room, Put-in-Bay’s newest dance club, or rent our the whole Mr. Ed’s Bar & Grill for a private function. If you are looking for an indoor/outdoor venue for your party or wedding, we also offer our MIST tiki bar area which can accommodate up to 200 people. The newly rebuilt Commodore Resort also includes a Subway Restaurant. Here, you can get your choice of handmade subs with garden-fresh toppings, made right before your very eyes. Mr. Ed’s Bar and Grille was also recently rebuilt and features the island’s best bands. The bar and grille are now connected to the new section of our downtown Put-in-Bay hotel. This makes for easy access for our guests, rain or shine. Mr. Ed’s is now three times the size of the original wooden bar. Now the area spans over 3,000 square foot. Additionally, there is a second story viewing deck which overlooks the gorgeous Put-in-Bay harbor and DeRivera Park. At night, the upstairs turns into the island’s hottest dance spot, The Green Room. Here, local DJs spin tunes all night. Private parties can rent out the upstairs area. This affords the best views of downtown Put-in-Bay. We will continue to offer great food from our expanded menu, onsite catering, and great entertainment, featuring bands during the week and DJ’s on the weekends. Check out our newest food offering, Cameo Pizza! When you are ready for your island getaway, you can easily book a room online at the Commodore Resort or call us at 419-285-3101.